There is really no doubt that Samsung has created a highly likeable flagship pair. Both devices offer cutting edge tech and stellar performance and you can’t really go wrong if you pick one up. There is, however, the question of the steep price tag. So if you happen to live in the US and are waiting for a better deal on a new Galaxy device, now seems to be a the most opportune moment, as both Samsung and T-Mobile are running promotions on the Galaxy S6 and its edged sibling. 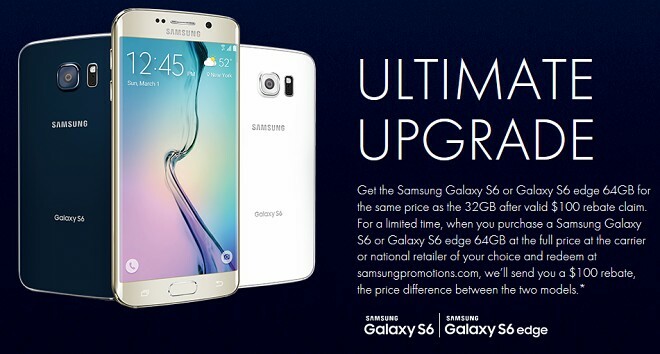 Samsung just announced its Ultimate Upgrade promo. It boils down to a price cut of $100 on the 64GB model, bringing it down to the price of the 32GB one. Double the space for the same price really sounds like a nice deal. The promotion is live now and will remain up until July 5. You do have to apply for the $100 rebate, but, the extra hustle is worth it. And, if that doesn’t sound good enough to you, or you find 64GB still kind of limiting, T-Mobile has you covered. Come June 24, up until June 27, the US carrier will be selling the 128GB models of the S6 and S6 edge for the price of the 64GB ones. 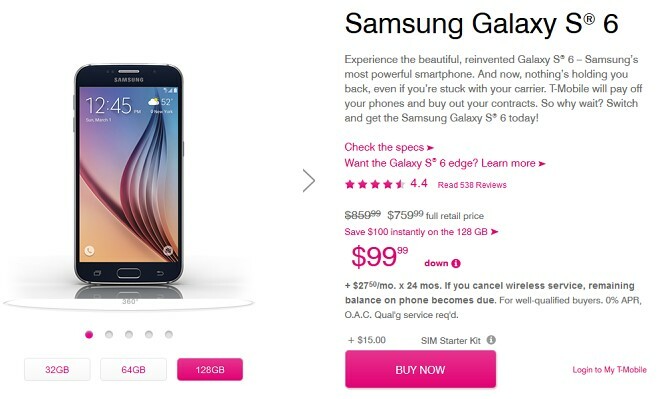 Thus, full retail prices at T-mobile for the S6 will be – $680 for the 32GB one and $760 for a 64GB or 128GB one. The S6 edge has an extra $100 markup at $780 for the 32GB one and $860 for the others. You could also get any of the devices on contract with $100 down payment for the bigger ones and free of charge for the 32GB variants. Both the Galaxy S6 and S6 edge pack a gorgeous 5.1-inch Super AMOLED QHD display, an in-house Exynos 7420 SoC and 3GB of LPDDR4 RAM. This is complemented by an impressive 16MP camera with OIS, phase detection auto focus and 4K capabilities. Of course, there is an array of other goodies as well, like LTE Cat.6, Wi-Fi ac, Bluetooth 4.1, NFC, GPS with GLONASS and Beidou, IR blaster and FM radio. The Galaxy S6 is powered by a 2,550 mAh battery, while the Galaxy S6 egde has a 2,600 mAh unit.